A pit bull ran up and clamped its jaws around the head of Margaret Hargrove’s Scottish Terrier. Doing her best to save her dog, she bit the back of the pit bull's neck. It paused a moment then resumed its attack on her dog. Margaret bit it again. She's lucky that a neighbor ran up and hit the pit bull with a baseball bat. It fled. Five-year-old Selena Burks was playing with other kids in Alabama when a 125-pound dog attacked her. She suffered crushed ribs, a punctured lung and liver. A heroic 11-year-old boy kicked the dog away and saved the girl’s life. Every year, roughly 1,000 people are killed by dog attacks in the U.S. alone. And many more are injured. Pit bulls have attacked more people than all other breeds combined. When a dog attacks another dog or person, kick its ribs from underneath full blast with the top of your foot near the ankle – like punting a football. Or Heel-Stomp its rear legs to disable the beast (details below). The Humane Society says children are more likely victims because they behave in ways that dogs find disturbing, like running, yelling or making sudden moves, and less likely to be perceived as dominant because of their small size. In September 2013, a toddler was killed by pit bulls in Colton CA, and another was killed by pit bulls in Gilbert AZ. In October, 5-year-old Jason Ryan, of Baker City OR, was killed by a neighbor's pit bull. In November, in Kernersville NC, 25-year-old Katherine Atkins was killed by her two pit bulls. She had owned the dogs since they were puppies. And in Wilton CT, a pit bull suddenly attacked its owner, 56-year-old Anne Murray, ripping off her left arm and right hand. Her family, too, had raised the dog since it was a puppy. 10-year-old Kenny survived an attack by a huge Mastiff. As the dog lunged at his throat, Kenny instinctively threw up his arm. The dog latched onto his forearm as Kenny remembered his father's advice, "Plunge your thumb deep into the dog's eye." Kenny burst the dog's eyeball like a grape. The dog released him and fell whimpering to the ground just as Kenny's older brother arrived with a pipe and beat the vicious dog to death. Once a Doberman charged at me. While it was still 10-15 feet away, I roared and lunged at it. It turned tail and ran off. Another time, a big dog ran at me across a field. I grabbed a tree branch off the ground and charged at the dog. He turned tail and fled. Usually, a dog's body language indicates it's about to attack by standing still with a stiffly upright tail while barking and snarling. An especially attack-prone dog usually will not back away, and may try to circle around and attack from a different angle. Our impulse is to run when threatened by a dog. That’s the worst response – it triggers the chase instinct in dogs (and knocking down a runner from behind is easy). Instead, stand still and act calm. Don't stare into its eyes because dogs consider that an aggressive challenge, so just look in its general direction and watch it with your peripheral vision. Try yawning and licking your lips (a dog’s "calming behavior" to signal passivity) while slowly backing away. Do not turn your back. Hopefully, the dog will lose interest and wander away. Make fists so the dog won't bite off a finger and cross your forearms across your chest. Be ready to protect your most vulnerable anatomy – the front of your torso from your groin to your throat – often a dog's primary target. Let the dog sniff you. In a low voice say, "No!” Stay still until the dog leaves. Back away slowly until it's out of sight. An ultrasonic dog repellent is useless on a vicious dog, but pepper spray usually works. If a dog does attack you, try to "feed" it your jacket, bike equipment, briefcase, or purse as a distraction while you back slowly away toward safety. If you’re knocked down or fall, curl into a ball (face down on the ground) and keep your arms wrapped around your ears, face, and neck (with your hands curled into fists). Try not to scream or roll around. If a vicious dog has clamped onto you, do not try to wrench yourself free – that’ll just add to the damage and tighten the dog’s grip. Since a dog can severely injure or even kill you, an aggressive defense may be necessary. In 2002, a stray pit-bull dog attacked a two-year-old Detroit boy and began dragging him down the street. Horrified witnesses tried to intervene but the dog would attack them briefly then resume dragging the child. No police were nearby, six people were hurt, and the child seemed doomed until a passing motorist noticed the commotion, stopped, and shot the dog to death. A passive or moderate defense may be futile, if not fatal. You can strangle an attacking dog by pressing with all your might on the carotid arteries on both frontal sides of its throat (a few inches below its jaw's hinges). Its brain is quickly deprived of blood/oxygen and the dog will go limp within seconds (or die, if held longer). YOU NEED BOTH HANDS with your thumbs pressing while your fingers grasp the back of the dog's neck for leverage. If you release the limp dog too soon, it will regain consciousness within seconds and perhaps attack again. Thus you may want to first bang its head against a solid surface to knock it out, or break its ribs by ramming its chest with your bent knee, or heel-stomp on its legs to break them so the dog will be less able to attack you further. 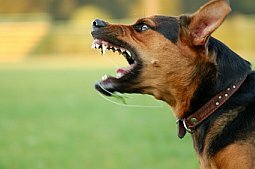 If an attacking dog has clamped onto another person or dog, simply use the same grip but now you’ll be behind the dog and your thumbs will be on the back of its neck for leverage while your fingertips press on the carotid arteries. Make sure you press on the carotid arteries on both frontal sides of its throat, rather than pressing on its windpipe in the center of its throat because that merely chokes it (depriving it of oxygen to its lungs) and takes 30-90 long seconds for the now violently convulsing beast to be rendered unconscious (or dead, if held longer). What if the dog has already clamped onto one of your hands or arms? IF YOU CAN’T USE TWO HANDS ON BOTH SIDES OF THE DOG’S THROAT, try to grab its collar or loose skin to wrestle it to the ground and kneel on its throat. Or, quickest of all, plunge your thumb deep into its eye to burst it! That'll probably stop its attack. If not, to most effectively defend yourself, strangle the beast! Pepper Spray will greatly enhance your safety – from both a human attacker as well as dog attack defense. Eight dogs, including four pit bull terriers, killed Pamella Devitt, a 63-year-old female jogger in rural Los Angeles CA on 09 May 2013. A witness called 911 and, luckily, a cop was nearby and soon arrived as one dog was still attacking the dying woman. The cop tried chasing the dog away but the dog began attacking him until he fired his gun and the dog ran off (the loud “bang” apparently scared off the dog but it’s too bad the beast wasn’t shot to death). Anyway, by then, the defenseless jogger had already bled to death. Residents say vicious dogs constantly roam the area and had attacked people before. Of the 4,098 fatal and disfiguring dog attacks on humans in the past 30 years in the U.S., a total of 3,295 (80%) were by “molosser breeds,” including pit bulls (62%), Rottweilers (13%), Cane Corsos, mastiffs, boxers, and their mixes. There were 4.8 million reported dog bites in 2012. From 2005 to 2012, pit bulls killed 151 Americans – with 52% involving a family member attacked by a household pit bull. Aside from pit bulls being by far the most likely to bite, they cause far more damage than an ordinary dog does. A spaniel’s bite, for instance, might leave two puncture wounds. But a pit bull’s ‘hold and shake’ bite style causes drastic bone and muscle damage, leaving hundreds of puncture wounds and severe soft tissue loss often causing permanent disfigurement and even death. Furthermore, once a pit bull attacks, a gun may be the only way to stop it.